The College itself has seen plenty of active growth since its founding in 1887, and the changes in buildings, programs and people make it tempting to see our trees as stalwarts, rooting the campus to a time before its very existence. There is plenty of truth to that notion, particularly when it comes to Pomona’s coast live oaks and sycamores. And yet the history behind our trees—which also include eucalyptus from Australia, crape myrtle from China, coral trees from South Africa—is more tangled than the neatly-maintained landscape lets on. Pomona’s soaring sentinels form more than just a scenic canopy. 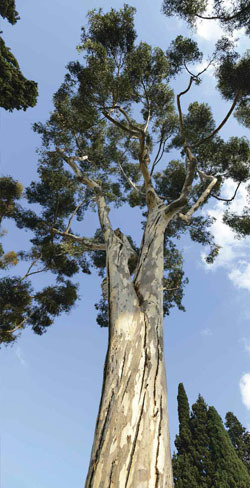 The trees reveal a Golden State story, but one with ties to nearly every continent. Strolling through campus, Carlberg is quick to identify noteworthy trees with roots around the globe, from “very, very old” Italian stone pines towering over Walker Beach to an unusual Chinese wingnut tree in front of Harwood. Well-groomed Pomona trees like these helped shape Carlberg’s career path. She was in her early teens when one day her father drove her past campus and she “saw a tree that I knew had been pruned just impeccably.” Soon, she was working for the tree care company that did the work. Later, as she went on to get her degree in landscape architecture, Carlberg became fascinated with Ralph Cornell, Class of 1914 and Pomona’s first landscape architect, and today she treasures her copy of Cornell’s Conspicuous California Plants given to her by his widow, Vera. The arborist is only one of a number of Ralph Cornell aficionados still found among plant-lovers in the region. THOUGH CORNELL GRADUATED a century ago, his plantings remain a conspicuous presence, and the late landscaping genius is still central to the story of Pomona’s intriguing mix of trees. Cornell was fascinated with foliage from his first semester at Pomona, when he took a botany course with charismatic Biology Professor Charles Fuller Baker. Soon, Cornell had a business venture selling saplings grown from Mexican avocado seeds, and the profits enabled him to go on to Harvard and earn his master’s in landscape architecture. Cornell found his way back to Southern California, and Pomona quickly hired him as the campus’ landscape architect, a role he would hold for four decades. This all comes from a senior paper by biology major Nik Tyack ’11, who learned about Cornell while examining campus water use on a sustainability fellowship. Tyack became so taken with the work of Pomona’s first landscape architect that, along with writing the paper, he also co-founded the Ralph Cornell Society, a group of students devoted to tending native plants on campus. Cornell’s advocacy for California flora is well-chronicled in Tyack’s paper, which recounts the landscaper’s pioneering ponderings about the state’s plants and the possibilities of creating a “Genuine Southern California Park.” But once he became Pomona’s landscape architect, Cornell took a very different approach, “designing mind-boggling creations in which plants from areas as far apart as New Zealand, Central Asia, Europe, Australia, Japan, China, South Africa and Southern California mingled in a single landscape,” writes Tyack, now an environmental consultant back East. This was the thinking of the time. With a climate unique for North America, the state became a center for arboreal experimentation. “People began to think of California as this place where you had this cosmopolitan mix of trees from around the world,” says Jared Farmer, author of Trees in Paradise: A California History. That thinking was fed by the acclimatization movement, which sought to systematically and scientifically spread species globally to increase local biodiversity. “The idea,” Farmer says, “was to find the perfect place” for a particular plant. CORNELL WOULD BE REASSURED by the direction Pomona is marching in today. When it comes to campus trees, the emphasis now is on native ones, though not exclusively. And grounds crews keep planting new ones as the College works to preserve—and in some cases expand— green space. As an example, Assistant Director of Grounds Kevin Quanstrom points to a previously- paved area north of Big Bridges recently converted to open space, with walkways and seating. Add to that a perfect row of California fan palms, the only palm native to the state, along with newly-planted sycamores and, of course, oaks, which make up about a quarter of Pomona’s roughly 4,000 trees, reaching into every corner of campus. 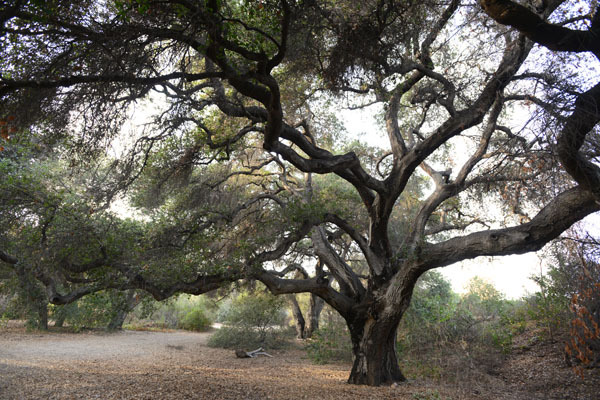 These native oaks are “the classic tree of Mediterranean-climate California,” notes Bart O’Brien, co-author of California Native Plants for the Garden. Not only are the oaks sophisticated ecosystems unto themselves, he points out, but their acorns also once played a role in the seasonal food supply for Native Californians. Today at Pomona, the old oaks help tie the campus to a time long before the College was established. Deep in the Wash, where the wild oaks reign, trees Nos. 2110 and 2111 hold their ground— and keep a secret. Arborist Cy Carlberg has a hunch that these two are somewhere in the range of 300 to 400 years old. “It’s just a gut thing,” she says. “I look at old wounds. I look at the way the wood has adapted. It’s just a feeling.” The trees’ size alone doesn’t prove their ages—the rate of growth can vary greatly with water supply. Without intrusive measures, there’s no way to count the rings and know for certain their ages until these oaks come down through rot or storm. And that day, we can only hope, is still centuries away, leaving a lingering mystery to this California tale.